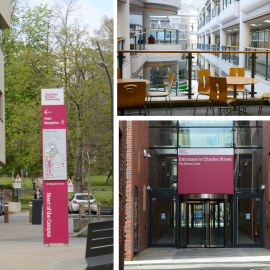 Library, Arundel, Aspect Court, Cantor, EMB, Harmer, Norfolk, Stoddart, Atrium, Charles Street. Library, Collegiate Hall, Main Building, Robert Winston Building, Saunders. To help you plan your study time, you can ‘find a free computer’ on shuspace or SHUgo, which says how many PC’s are free in an area / on a floor – including faculty buildings, and break out areas across both campuses. Please note – The study spaces are only open during the day, so you’d need to use the Library at night time, which is usually quieter anyway. doing your own thing – and then of course there’s finding the right combination for you, do you have a favourite spot, like a specific area, prefer to go home and study, have a break in your timetable and want to stay in your faculty building? We have these options covered too, try… self service laptops, Chromebooks, day loan laptops, week loan laptops, Smart locker laptops in building across the campus. If you bring your own device make sure you choose a space without a fixed PC. If you sit at a desk with a PC you may be asked to move as the PC will be available for others to book.